Enhance your life with music and movies! Our home theater installation team can provide you with an amazing surround sound experience in the comfort of your own home. Our design team can bring together the elements of theater seating, decor, lighting, crystal-clear sound and amazing picture to provide you with your own dedicated theater. Movies and sporting events at home were never so much fun! Tired of juggling 8 remotes to watch TV? Let our programmers make operating your audio/video system a breeze. ONE universal remote from us will control everything easily and reliably. Want to control your surround sound system, whole-house lighting, security cameras or thermostats? We make it easy! Feel safe by monitoring your house or business with our security systems. On vacation? See what's going on at your home from your phone or tablet from anywhere in the world. 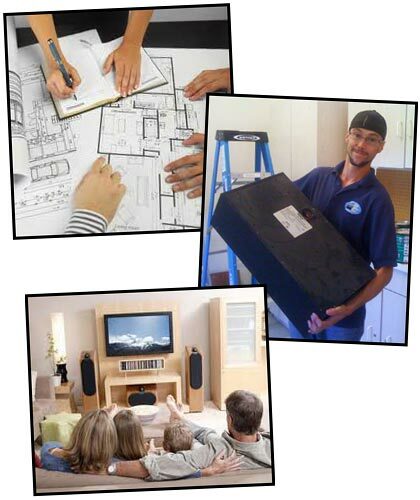 You've found San Diego's leader in home automation, surround sound and home theater. We offer service and solutions for all types of today's home electronics. You don't do this for a living...we do! Eliminate the guesswork and leave it up to us to explain what's available today, to determine your needs and to look at your home to see what will be the best fit for you and your family. We take the frustration out of using these toys with tutorials, cheat sheets and follow-up phone calls and e-mails. We WILL ensure that you are enjoying your new additions as opposed to wanting to throw them through a window.